RSNETWorx sees the scanner revision number. AS Series B, the scanner is identifed with as many numbers as 4 to 50. As a Mode in the Series C, you can see the Series C between 6 with minor number as 2 or higher. To work with Series C improvments are given below, the configuration switch in the scanner module is Switch 5 which should be put in the on or “1” role. Module New improvements for the Master DeviceNet Library Electronic Keying – added and consist reviewing the Major and Minor revisions. • Node Recovery – allows replacement device’s node to be automatically changed to the original devices node number. The replacement devices node number must be set to 63. • Configuration Recovery – allows the configuration of the replacement device to be the same as the original device. To be read of the network, the replacement device must be setup. The master scanner holds the Configuration Recovery files that are talking with the original device through RSNetWorx. Two channels provides an interface to two DeviceNet networks. Connect up to 63 slave devices per channel. The option to run in Slave mode. Implement several scanners in a local I/O chassis or in an I/O chassis on an I/O link. The ability to support Auto Device Replacement (ADR). No seperate connections are required as works with producer-consumer technology to give shared inputs. 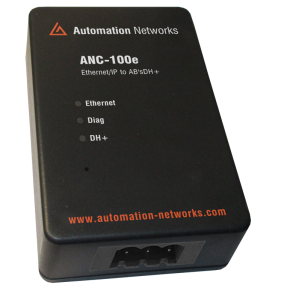 For Network and module status, comes with a reset pushbutton and a two-digit LED display. 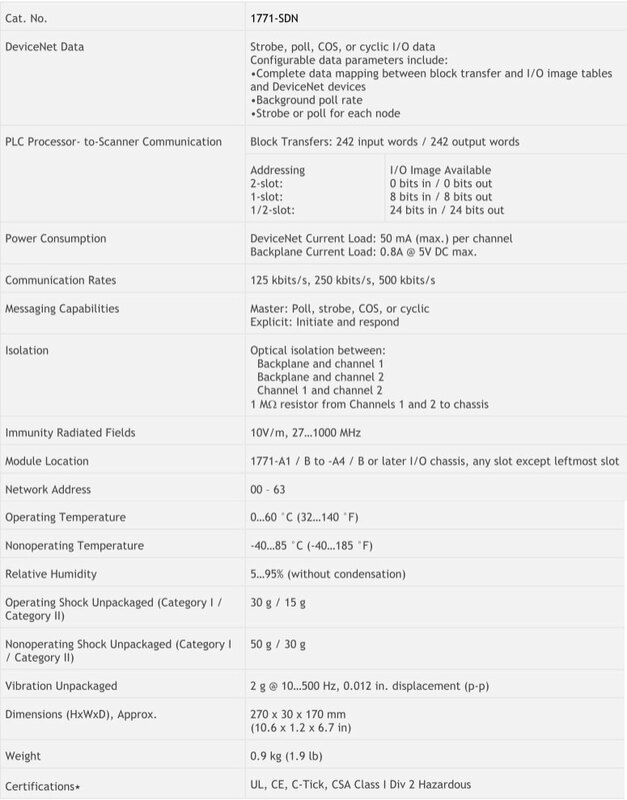 Idle, fault & node status are part of the diagnostic table that give network access to scanner. Performs like as an I/O data server giving messaging of explicit peer-to-peer. 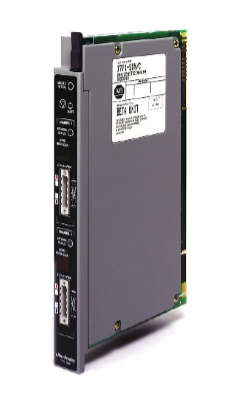 PLC talks with the processors either bi-directional block-transfers and single-transfers. Provides a maximum of 358 words of block-transfer of input data and 358 words of output data (blocks of 62, 61, 60, 59, 58, and 57 words). Gives image bits of a max of 24 and image bits of 24 output for single-transfer of high-priority I/O data, depending on I/O addressing density.